Many construction conflicts and disputes are not limited to particular jurisdictions or cultures, but are increasingly becoming common across the industry worldwide. This book is an invaluable guide to international construction law, written by a team of experts and focusing on the following national systems: Australia, Canada, China, England and Wales, Estonia, Hong Kong, Iraq, Ireland, Italy, Japan, Malaysia, the Netherlands, Oman, Portugal, Quebec, Romania, Scotland, Sweden, Switzerland, and the USA. 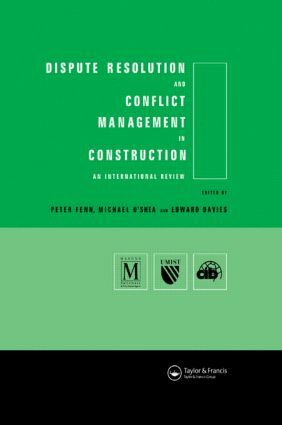 The book provides a consistent and rigorous analysis of each national system as well as the necessary tools for managing conflict and resolving disputes on construction projects. This series consists of a carefully selection of state-of-the-art research books derived from CIB activities. CIB, the International Council for Research and Innovation in Building and Construction, was established in 1953 to stimulate and facilitate international cooperation and information exchange between governmental research institutes in the building and construction sector, with an emphasis on those institutes engaged in technical fields of research. CIB has since developed into a world-wide network of over 5000 experts from about 500 member organisations active in the research community, in industry or in education, who cooperate and exchange information in over 50 CIB Commissions and Task Groups covering all fields in building and construction related research and innovation.